"Taxi Drive is the Brunetti booster/overdrive. It is endowed with “FET-DIODE” hybrid technology, class A gain structure, to shape the sound in an original and innovative way. These features make Taxi Drive very versatile: you can use it as a simple booster or to obtain a very warm and winding crunch sound, moving easily from bluesy to tweed shades. Thanks to sensitive and very effective controls, you can mould and color the sound as much as you like, respecting the basic and typical qualities of your instrument. Taxi Drive is perfect to boost crunch sounds into lead field or as a stand-alone effect, it gives excellent results in every situation!" "A boutique pedal homage to the unique onboard overdrive circuit in vintage solid state Vox Conqueror amps that George Harrison used on the White Album and other Beatles recordings. 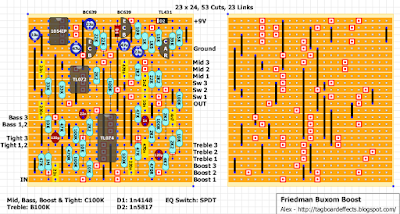 The White Pedal has four knobs that control volume (overdrive), gain (fuzz), treble cut, and a bass cut knob that acts as a mid-boost, while a fifth knob (the Yoko knob) selects the midrange frequency to boost for a parked wah sound"
Schematic should be correct but it's not verified yet. There was already a layout in the forum section but not on the main page. This version should easily fit in a 1590B box. "The Friedman Buxom Boost may be the most powerful tonal solution you ever put on your pedalboard. Like its namesake amp head, this pedal pushes a pure, clean signal to conjure the absolute most from your tone. Turning the boost control is your ticket to volume increase, pushing the front of your amp for thick harmonic overdrive, or balancing between two guitars with varying output. Whether you're after a tone tailored by its active mid, treble, and bass controls or the pedal's ability to achieve total transparency - thanks to its onboard EQ Bypass switch - it's all in there. We've even added a useful tight control for reigning in your tube amp's bottom end when boosted. As expected, every Buxom Boost pedal is crafted with the attention to detail and fine ear for tone that comes with Dave Friedman's name. Your tone, just more of it. Just like the Friedman Buxom Betty amp head, the Buxom Boost sings with a completely clean tone that makes every nuance of your performance shine though. Simply flip the pedal's onboard EQ Bypass switch and you have a completely transparent signal, adding muscle to your guitar without ever changing its fundamental character. Tuned for your rig. Though the Buxom Boost can be tonally invisible, its active 3-band EQ and powerful Tight control enables it to be anything but. With a stomp of a switch, you're able to balance the voice and output of two different guitars or push certain frequencies for a solo tone that cuts. With the Buxom Boost's high-quality components, you'll be astounded at how well it works for fine tuning your acoustic-electric guitar's plugged-in voice." Schematic from Bugg available here. 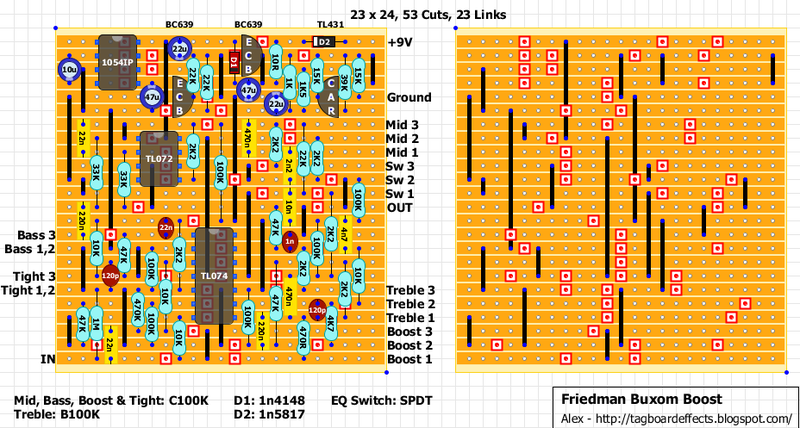 There are 2 layouts (circuit runs at +/-9V). The first one with the original bipolar voltage converter. The second one without it. Special thanks to Bugg for providing new schematics. 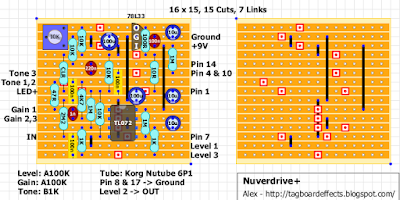 A different overdrive that uses a Korg Nutube. If you live in UK you can find them here. Original project and schematic available here. Since I just poster the original Vox Distortion Booster, I figured I'd post the second version while i was at it. 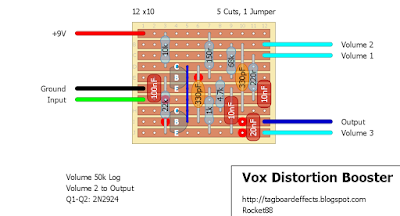 Just like the V8161 the V2 is also a Fuzz Face variant. 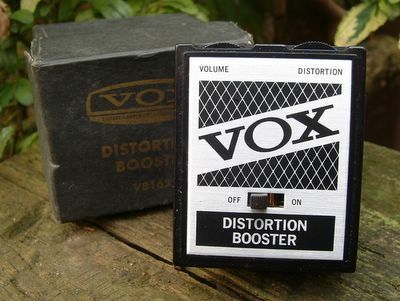 The Vox Distortion Booster V2 is similarly as rare as the V8161, but being a Fuzz Face variant I'm sure we all have an idea of how it will sound. First layout of the new year!! Figured we'd start off right with another classic fuzz. 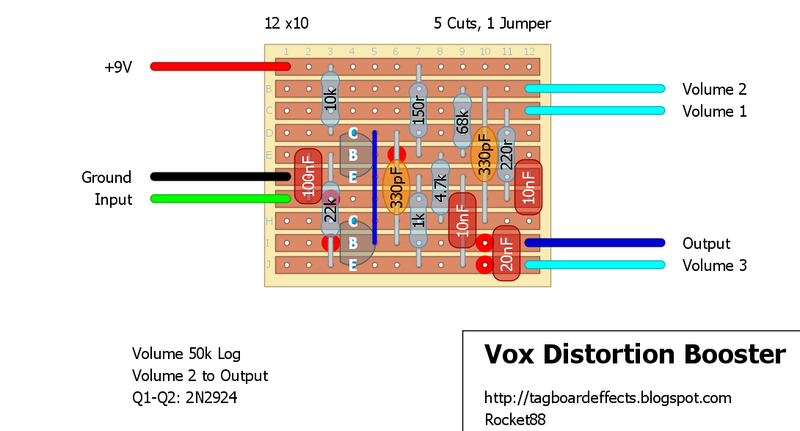 The original Vox Distortion Booster is a Fuzz Face variant unlike the reissue, which there's a layout posted. 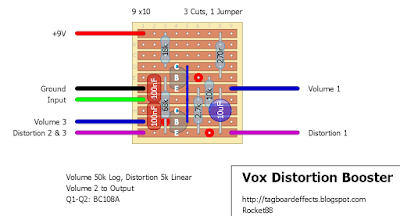 The Vox Distortion Booster V8161 is stupid rare, so no video clips, but being a Fuzz Face variant I'm sure we all have an idea of how it will sound. The Distortion Booster V8161 was made to be plugged directly into your guitar, similar to other effects of the time period.